Online surveys can be a great way to “take the pulse” of your membership - or in our case, our readership. In January, we asked our readers to participate in an annual online survey to find out the key issues impacting small non-profits and membership organizations and what information we could offer in the Wild Apricot blog that might help. Thanks to all of you who took the time to respond to our survey! It’s great to have your feedback – which we value and act upon. Since we added some new questions to this year’s survey around membership expectations and issues, we’ve decided to cover the survey results in two separate blog posts. In this post, we'll focus on the blog - profiling its readers, their organizations and why they read this blog. In the second post, we'll offer some insight into survey feedback around key membership issues for 2012; expected growth; as well as challenges. Who’s following the Wild Apricot blog? 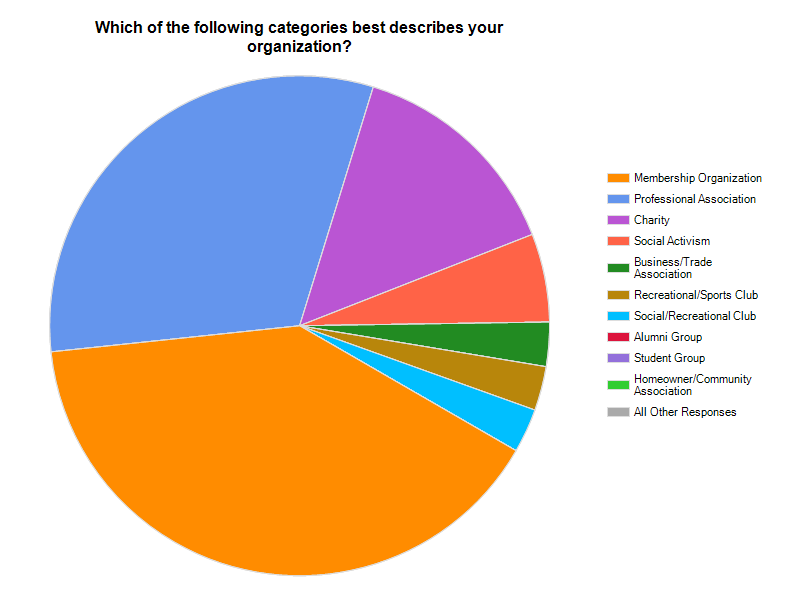 It’s interesting to note that this year, the majority of survey respondents were with membership organizations (38%), professional associations (30.5%) and charities (13%). As you can see from the graph below, our blog readership profile has changed slightly over the last year. 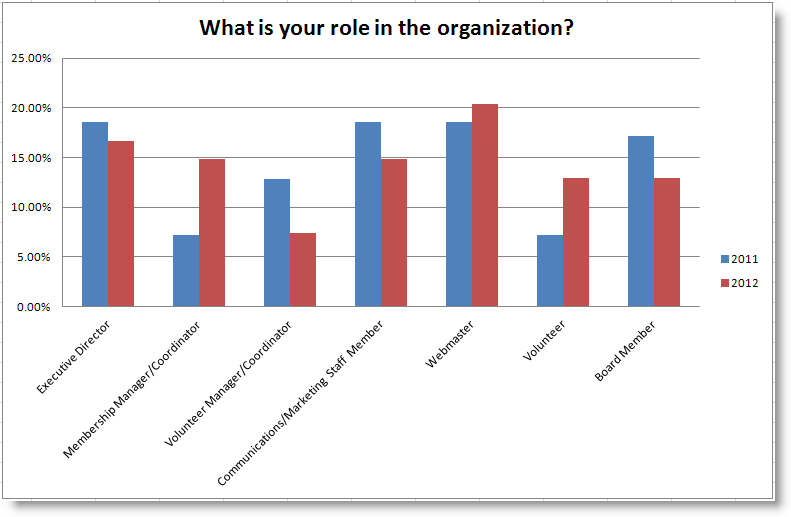 Currently, the majority of our readers (at least those who responded to the survey) are: Webmasters, Communications/Marketing staff, Membership managers, Board Members, and Executive Directors. Of course, we understand that both the volunteers and staff of small organizations may also wear a number of hats. 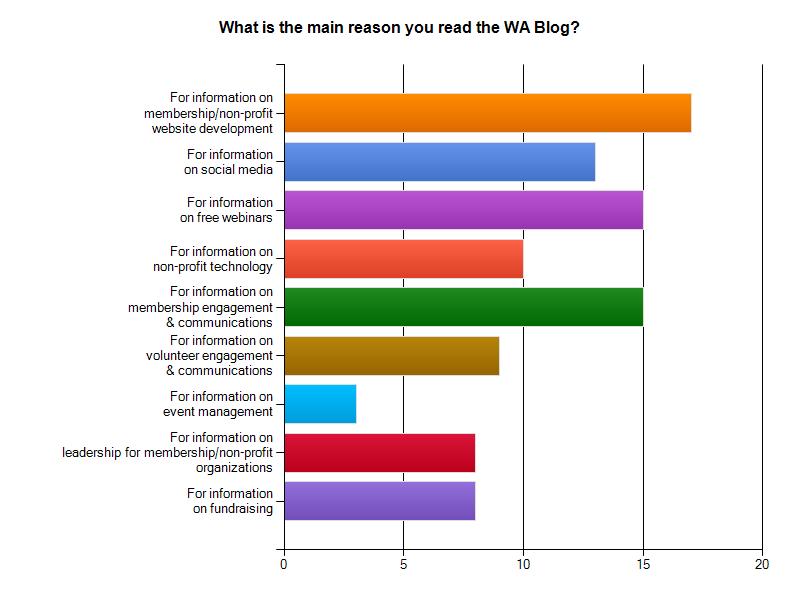 While we realize that there may be a number of reasons folks follow our blog, the top reason offered in this survey was information on Membership / non-profit website development. And we weren’t surprised to see that another highly rated topic corresponded with the #1 “key issue” facing membership organizations this year: Membership engagement & communications. In addition, we found that readers are also keen to read our monthly round-up of non-profit webinars. Public Relations resources & how to engage the media for free publicity, press releases, etc. I like the current mix of topics - it's a very helpful resource for a volunteer group with no budget to speak of! I love all the information that I learn from Wild Apricot. In Part 2 of our Blog Reader Survey Results, we’ll offer more information on our readers’ key issues; expectations for and challenges to growth in 2012, along with insight into key methods of recruiting and communicating with members in Part 2 next week, so stay tuned to the Wild Apricot blog.